Did you know that there is enough opportunity for the small businesses to seek benefit of Black Friday by mastering the art of winning customers and keeping them coming back to you for more? The entire retailer industry has geared up to face the most frenzied season of the year as 23th November has already given consumers the required kickstart to their best time of the season- the holiday time! Shops will now be flooded with customers who will be confused enough about grabbing the best bargains. Black Friday lets companies lure more and more customers as discounts and rebates are the main attracting bait for them. To add to the already existing hype, the 2017 Black Friday is touted to become the biggest yet, in spite of the slightly depressed economy. 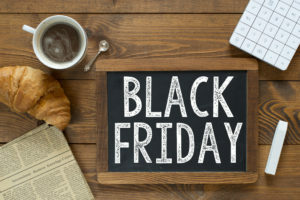 There is a change in buying behavior among consumers and they are of the opinion that all those businesses which don’t participate in Black Friday will probably face cash issues. Consumers actually need to start off with the researching process weeks before the actual Black Friday weekend. This way you will know where exactly you can find the best Black Friday deals. If the retailers and small businesses want to benefit, they need to highlight and promote their specials way ahead of time and also have teasers. This works more like an advent calendar and offers customers to look forward to something. You can even create a hashtag where you reward customers who can give you the image of the best product. This can create a ripple in the social media. Black Friday is a day which is always hot on the lips of all customers around. If you’re the small business owner, you have to be a part of the conversation to make sure you know what exactly your target market is looking for. What kind of deals are they hunting for? It is only this way that the companies can meet the needs of the consumers. You can request your customers to write to Santa so that they might submit their wish-lists for Black Friday. Use Twitter as the best platform for Black Friday real-time conversations. The minute Black Friday arrives; all your stocks will soon fly off your market shelves. Hence the companies and businesses need to ensure that their levels of stock are all updated. You shouldn’t disappoint and dishearten your customers when they don’t find the item that they were looking for just because it is out of stock. You can embrace an online solution to track sales and inventory in an easy manner. This will help the company have enough time to stock the shelves with the best products. Black Friday is a speedy affair and the website of a company should have the capacity of handling double traffic than what it usually does. Customers move miles away from slow running websites and from inefficiency. Hence, you being a business owner can get in touch with an IT professional to make sure your website can handle the immense pressure and prevent you from running losses. Therefore, now that you know how you can prepare your business, your retail store and your company website for Black Friday, what are you waiting for? Ensure taking all the required steps to make your company one among the best to survive the Black Friday frenzy.